I reluctantly crawled out of my cozy warm waterbed and cringed at the Arctic blast as I let our way-too-excited-for-this-early-in-the-morning dog outside. Next I showered, dressed and applied makeup with the mindless robotic precision that comes from decades of repetition. Then it was time don my coat and shoes and brave the elements outside to unplug and warm up the ice-cube-on-wheels car for ten minutes. Hurrying back inside as my hair turned to icicles, I stepped out of my snow-covered shoes and threw my coat onto the three carpeted steps of the front door foyer. Like I do everyday. Heading to the kitchen to orchestrate Feeding Time At The Zoo, I hear Daughter's radio alarm go off in her bedroom. Huh, must be up early to study for her test today. I found myself laying at the bottom of our foyer stairs. And looked up to find the dog’s nose in my face and one of the cats hovering nearby, head cocked sideways in wonder. Both had rushed over to discover the source of the resounding crash. Suffice to say, it turns out a down coat laid over carpeted steps makes an amazingly proficient toboggan. I discovered the other two fraidy cats had sought refuge cowering in the hallway – frightened eyes glowing wide in the dark - their food dishes spilled and water splashed everywhere on the kitchen floor. I guess I freaked them out. Oh well, at least Casey and Sheba came to see if I was okay. Because other than music, nothing was emanating from my teenage daughter’s room. What a beautiful white coat you have. No, really, I hope you didn't get hurt. I guess you won't be making that mistake again for a while, although it does sound like a bit of slapstick. I think I might have laughed a bit if I had been there. I hope you don't mind. Whoops, good job you didn't break anything! The Finely Tuned Woman: Oh, it was slapstick alright... and I did laugh about it too, so I don't mind at all. Lady Banana: Nope, nothing broken, except my pride maybe. Joeprah: LOL!!! I just saw that movie last week! At least I didn't scream like a little girl like those guys... Other than a hyperextended left arm (I tried to brace myself), I'm unscathed. Ha ha ha ha ha! I'm sorry ha ha ha! That made me chuckle... Then I looked at the photo and giggled... Then I read the bit about the cat food and water and fell about laughing! Now you know why my wife and I insist we will never again buy a two story house! Yes, a big fluffy coat is a good stair toboggan, haha. And now, ha ha ha hee hee, SNort. Good thing you didn't get hurt! What a place for a coat. That would never happen in our house because it's just my husband and me who wear coats and the coat rack is right by the door. At least your cats were concerned. Unfortunately there isn't any other way to learn this stuff. Fortunately it wasn't a full flight of stairs, or else your "flight" may have had a harder landing! Babs: Yeah, with my aptitude for klutziness, I will never run out of material to blog about... unfortunately. PaulsHealthBlog: Ha! Yeah, good thing we live in a bungalow, that could have been much worse! Merry Christmas to you too! Drowsey: I'm a bit sore today... and to ensure my title of All-Time-Klutz, I backed into a doorknob today; right on the same spot I bruised yesterday.... cripes I swore to myself (I was at work). Jo: Ha! I made you Snort!!!! Karen: Oh, I have a coat rack alright... right by the door. I was just too lazy to hang it up again for 10 minutes... serves me right. Dan: You are so right... I cringe to think how the heck I could cook a turkey and clean house with an arm in a cast! So a bruised back/side isn't so bad. oh owie. Totally something I would have done. Glad you didn't break anything!! Good grief! Well, I'm glad you're OK! Your description of the cat who came to see cracked me up - I can sooo imagine that! LOL! See, this why I could never live in Ontario. You'd need a coat like that to stop bits falling off you, and I'm allergic to feathers! It's a winder you weren't hurt. Thump, thump! Indeed. I have fallen down our stairs, so I know what it feels like. Please stop by and read A Christmas Mystery. Glad you're OK. You can take some comfort in the fact that this post proves you are a TRUE blogger. Whereas anyone else might've been more concerned about a sprained ankle or jammed wrist, a TRUE blogger grabs the camera and takes a picture of the accident site. Well done. Agree with JD. No concern about the pain. It's more "Hey, I can use this for my blog. Oh, yeah, baby." Blog fodder is everywhere. You don't even have to wait for it. Jay: Yeah, being allergic to feathers would indeed not be good. 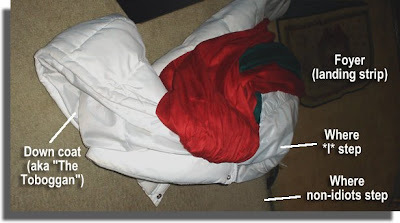 I love my down coat; it's like being wrapped up in a warm blankie. Swu: Thanks. And yes, I dropped by. Your story, as usual was terrific! You have such a great knack for weaving a wonderful tale. JD: Ha! You caught me... yeah. After it happened, my first thought was, "I am SO blogging this". Geez. How lame am I? OUCH!! I hope you're okay and are able to laugh about it now...could have been lots worse! JoJo: Oh, thank goodness there WASN'T video!!! Yikes! It's bad enough to admit to being a dork, it'd be worse to actually watch it! Toners: I'm fine... Happy Holidays to you too! This sounds like something I would do. I am glad you did not seriously hurt yourself. And my husband is so used to my carzy clumsiness if he doesn't hear me scream bloody murder he doesn't come running either. Vegas Princess: Ha! Yeah, we DO tend to make people numb to our constant accidents, don't we?